For every aircraft owner, the annual inspection is a big deal. It means downtime, expense, and angst (over what might be discovered and the cost to repair it). A good relationship with a trustworthy, knowledgeable shop is the best way to mitigate the most unpleasant aspects of the annual inspection. Since Warrior 481 adopted me in 2004, I have interacted principally with two shops: Conrad Aero in Three Rivers, MI and Boshart Enterprises in Batavia, NY. One of the factors in my decision to relocate from the Le Roy Airport (5G0) to the Williamson Sodus Airport (SDC) was the presence of B.A.C. Services on the field there. Owned and operated by "Helicopter" Ray (my daughter's nickname for him, a disambiguation from the other Ray who owns the Le Roy Airport), B.A.C. Services is the go-to shop for the Williamson Flying Club as well as several of my friends from Le Roy including "Airport" Ray himself (when it comes to the Rays, my policy of not using last names on this blog becomes decidedly awkward). Helicopter Ray used to make house calls in Le Roy and tended to the Warrior a few times when a flight to Batavia for maintenance was simply not possible. He is careful, thorough, dedicated, and trustworthy. For Warrior 481's 2015 annual inspection, I made the switch to B.A.C. This was difficult for me because I have a good relationship with Boshart Enterprises. But for the first time as an aircraft owner, I had access to high quality maintenance right on my home field. After dropping off the airplane this year, there was no need for convoluted logistics to return me from a distant shop to my car (which usually relied heavily on the kindness of my friends). For example, in 2014, Darrell drove me back to Sodus from the shop in Batavia in a rainstorm, then returned home to Le Roy; a round trip that required over two hours for him to complete. I have worked with enough different mechanics over the years to know that, while everyone strives to cover the critical details, each has his own areas of emphasis. In Three Rivers, John found things overlooked by the pre-buy mechanic I used in Guthrie, OK. Boshart Enterprises found things missed by John. Ray has a reputation for a keen eye and I strongly suspected that he would find issues unnoticed by all of his predecessors...and he did. I visited the shop mid-inspection to get an update on progress. Ray walked me through the list of discrepancies (all minor), but he saved the best for last. "Oh, and I found THAT in your left wing," he pointed to a fist-sized block of steel sitting on his workbench. "Um...that's a bucking bar!" I observed. "Yup," Ray verified in typically laconic manner. It was tucked behind a rib in the left wing, sitting loose and undetected by everyone I had hired to inspect the airplane previously. Ray offered that Warrior 481 might fly right wing low now that all that weight was gone from the left wing. He also asked if I ever heard any loud thumps from the left wing in turbulence. Considering this, I am happy that there is no bucking bar shaped dent in the lower wing skin. Understanding its purpose, Noah inquired, "Was there still a guy holding it?" "Is bucking the new fracking, like from Battlestar Galactica?" asked non-pilot Kevin. My favorite comment came from Steve: "And here you thought you just couldn't keep the ball perfectly centered all these years." Nice. Because it would have been used for riveting wing skins into place, perhaps how the bucking bar came to be there is less of a mystery than when. Left behind by someone lacking Ray's attention to detail, possibly in the previous century, how many years has it ridden along in Warrior 481 as an unannounced (*thump*) hitchhiker? For me, the moral of the story is that a fresh set of eyes on any airplane is a good thing. Saturday morning, late May, Rochester, New York. Rays from a dawning sun fell across roof lines accented in frost from a pervasive overnight chill. Warrior 481 refused to start with her usual fervor, but was eventually coaxed into operation. Kristy, The Bear, and I climbed skyward on an instrument clearance that took us directly over Greater Rochester International before a Temporary Flight Restriction for the day's airshow barred the airspace to us. We were en route to our former home in Kalamazoo to visit Kent and his family. On this voyage, I was relegated to aeronautical chauffeur and had the front seat of the Warrior to myself while the womenfolk sat together in back. From Rochester, our airway route on Victor 2 bore us through Canadian airspace along the northern shore of Lake Erie. From an altitude of 6,000 feet, I spied the Point Abino Lighthouse for the first time and thought that it looked like a picturesque destination to visit on foot. We were switched from Erie Approach to Cleveland Center near the not-so-glamorously named Turkey Point (above). Center's transmitter is weak at the eastern edge of this sector and I have learned by trial and error that the automatic squelch setting on my ancient King KX-170B will allow me to hear Cleveland whereas the much newer Garmin GNS-430W will not. On my first trip through this region using the Garmin, I had to shut off the squelch entirely to receive Cleveland, thus enduring that flight leg to the sound of continuous, fatiguing static. This time, I contacted Cleveland using the older radio and was able to receive the controller reliably. Controllers in the area are aware of the weak transmitter issue and worked out lost communication plans with with me on both the outbound and return flights. On the east side of Lake St Clair, Detroit Approach diverted us from our clearance to prevent conflicts with traffic in their approach corridor. Instead, we were provided radar vectors to eventually bring us directly over the top of Detroit Metro Airport. 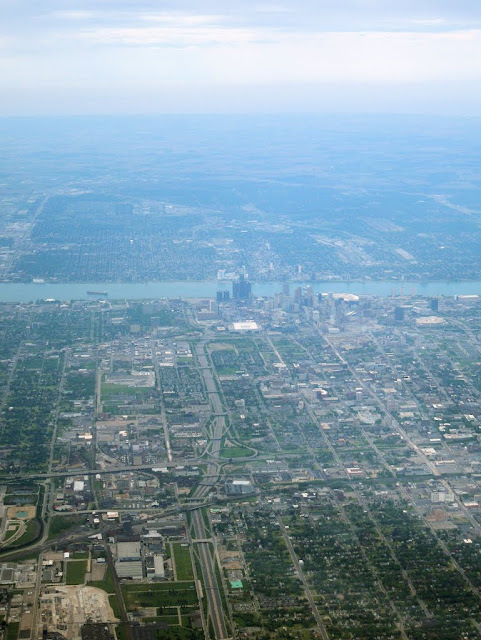 While on vectors, we flew over Windsor, Ontario for the first time. This took us closer to downtown Detroit than we had ever flown before. Paralleling our course at a lower altitude was a jet on final approach to runway 25 at the Windsor Airport. I was surprised to hear Detroit Approach providing radar services for Windsor. It did not occur to me that this level of cross-border ATC coordination existed, particularly after our experience a few years earlier when United States ATC could not find us while we were on flight following with Toronto Center (they should have just checked FlightAware). We paralleled the Detroit River as the familiar skyline of Detroit came into view. Ford's Dearborn Development Center marks the site of the original Ford Airport. Although it is no longer operated as an airport, it was one of the first modern airports in the world when it was dedicated 1924. It was the starting point for the National Air Tours of the late 1920s and early 1930s and, during its time in operation, garnered recognition for a number of firsts including: the first U.S. scheduled passenger service (to Grand Rapids, 1926), the first concrete runways (1928), and the first U.S. airport hotel (Dearborn Inn, 1931). Detroit Approach turned us toward the southwest in ten degree increments until we crossed the Detroit River north of Grosse Ile. Looking north along the Detroit River toward downtown Detroit and Lake St Clair. We were vectored almost directly over Detroit Metro, the closest we have flown to a major airport in Bravo airspace since our overflight of Atlanta at 4,500 feet in 2011. The difference, in this case, is that this is my hometown hub airport and it is far more familiar than Hartsfield. I have spent a lot of time in McNamara Terminal since it opened in 2002, roughly coinciding with the time I started travelling for work. Once Metro was at our tail, Approach cleared us direct to Kalamazoo. As we crossed over the Ann Arbor Municipal Airport, I wondered if they still had that pillow wrapped around the microphone in the tower down there. Beyond the Warrior's starboard windows passed the city of Ann Arbor, permanently entangled with the University of Michigan campus. Even from 6,000 feet, I was able to spot Hill Auditorium and the Chemistry Building, though it has been a couple of decades since I visited either. Our course paralleled I-94 directly to Kalamazoo. Along the way, ForeFlight/Stratus displayed several aircraft targets. Clearly, some aircraft in the local area were broadcasting ADS-B "out" to activate the ground based traffic system. One aircraft, a Piper Arrow, tracked a consistent five miles behind us for much of the route between Jackson and Kalamazoo. I greased the landing on runway 17. As we were marshaled to parking at Duncan Aviation, we saw that Kent's daughters were plastered against the FBO's glass door in anticipation of seeing The Bear again. They were evidently forbidden from ramp access until our propeller came to a stop (a good policy when three little girls seven and under are in the mix, I think). With the flight complete, we entered the "$100 hamburger" phase of our visit as both families piled into Kent's minivan bound for Erbelli's (home of my favorite pizza). Yum! After lunch, Kent and I returned to the airport for a quick flight. Kent has not flown in a light aircraft since he moved back to Kalamazoo from Rochester. Aloft, we found the air to be profoundly bumpy under the hot sun as we transited farm fields colored in differing shades of brown. Though I offered to let him fly, he understandably declined (as our mutual instructor was fond of saying, "we could do it, but it wouldn't be any fun"). We entered the pattern for runway 23 at Three Rivers, the airport where we both learned to fly. Upon reaching midfield, taking in the old visual cues, the words "carb heat on" came to mind for the first time in many years; conjured from thoroughly-imprinted memories of training in a Cessna 150 through that well-worn traffic pattern. It was another good landing. Not as short as I might have accomplished in the Cessna 150 with full flaps in the old days, but respectable for the Warrior. We topped off the Warrior's tanks from a fuel pump that was once verboten to us as students and renters; we flew out of Three Rivers in the days before the fuel was self serve. After fueling, we explored the old terminal building after overcoming the challenge of gaining access (I finally found the code in the Michigan Airport Directly via my phone). Inside, we found an office formerly occupied by our instructor filled with chairs. The field was deserted save for one aircraft that flew a right pattern to runway 23, landed, and dashed across the ramp to the T-hangars on the east end of the field. Despite the lack of activity, it was good to reminisce about our days learning to fly there. I was surprised to see that the old cinder block maintenance hangar still stood (above). As I recalled, the parallel walls on each end of the building were connected by a chain to prevent them from falling outward. We back-taxied runway 23 for departure and pulled Warrior 481 onto the run-up pad at the approach end. According to my logbook, the last time Kent and I flew out of Three Rivers together was in January of 2005. That night, Kent hosted a cook-out with many of our mutual friends who still live in the area. Afterward, The Bear had her first "sleep over" by sharing a tent with Kent's eldest that night. It was very exciting for them both, though I am dubious about the quality of sleep achieved by either one of them. After a delicious breakfast for all at Food Dance in downtown Kalamazoo, we drove east to Battle Creek and the Binder Park Zoo, a favorite destination. For the juvenile contingent, feeding lettuce to giraffes was clearly the highlight of the visit to Binder Park. The Bear's expression here sums up the experience perfectly. A mixture of fascination at feeding exotic critters and revulsion at being licked by a sticky, foot long tongue. Still, a great time was had by all. It was good to see that the twins were finally old enough to participate in the wackiness that ensued. But no matter how much fun The Bear had that day, bad jokes from Daddy still earned annoyed glares. When we arrived in Kalamazoo, the folks at Duncan Aviation warned that the airport had implemented a $10 overnight parking fee for transient pilots that the FBO was obligated to collect. This was disappointing because fees of any kind have never been a part of my Kalamazoo airport experience. When we arrived at Duncan for the flight home, I asked the lineman about it. "Naw, I'll waive that. It's only $10 anyway." Civil disobedience at its finest. When we departed, a line of storms was approaching from the west. We launched in marginal VFR conditions: 5 miles in haze under a 2,700 foot overcast. The wind was gusting sufficiently that the Warrior often shuddered as we prepared her for flight. This was a prime example of weather that would have caused me to cancel a longish VFR cross country flight in the past, but was now trivial to manage with an instrument rating. On climb out, we discovered that the deck was roughly 2,000 feet thick. We emerged from it to cruise at 7,000 feet in the clear between layers. The cloud cover came and went throughout our journey home. I was surprised to hear Detroit Approach call a B-25, an F-16, a North American (T6? ), and a Travel Air as traffic to other aircraft. It was an interesting diversity of aircraft in the Detroit Bravo that day. Detroit Approach vectored us closer to Metro to minimize conflict with traffic, then cleared us direct to Sodus. Haze obscured the Detroit skyline. In the vicinity of the Welland Canal (eastern Ontario), we entered the clouds for approximately 30 minutes. They did not appear particularly convective and the ride inside was relatively smooth. Though rain streaked across the Warrior's skin, there was not enough of it to wash off the bird droppings we picked up in Kalamazoo. As we flew across the international border, I caught a glimpse of the Niagara River through the ragged cloud bottoms. In terms of actual flight time, we made the trip from Kalamazoo to Sodus in a mere two hours and fifty minutes, something of a record for us. This was all made possible by a ground speed that ranged from 143 to 152 knots throughout the flight. We were in one sprightly Cherokee that morning! We emerged from the clouds east of Buffalo and entered clear, turbulent air near Rochester. The bumps had their usual effect on The Bear, who finally succumbed to the cumulative effects of inadequate sleep in Kalamazoo. Once we were down and stopped in front of our hangar, Kristy had to prod her awake. I will interpret her exhaustion as evidence of a weekend well spent with wonderful friends. What do you get when you combine a business trip to Silver Spring, MD; a rental car; and one of two meetings cancelled at the last minute? In my case, it meant a visit to Chantilly, VA and the Smithsonian Air and Space Museum's Steven F. Udvar-Hazy Center. It was my first visit in a decade. Like its more Metro-accessible counterpart on the National Mall, many of the artifacts in this museum are not merely representative of type; they have specific stories to tell. As I explored, I did not see just an Aero Commander, a Cessna 180, a Boeing 707, and a B-29. Rather, I saw Bob Hoover's Aero Commander, Jerrie Mock's Spirit of Columbus, the protoype 707 / "Dash 80" rolled by Tex Johnson before a befuddled audience of Boeing and airline executives, and the Enola Gay. These are impressive aircraft with amazing stories behind them. The cavernous space features airplanes hanging from the ceiling like Christmas tree baubles. This gossamer contraption is the Langley Aerodrome. Samuel Langley, who was affiliated with the Smithsonian, was in competition with the Wright brothers to achieve powered, controllable, heavier than air flight (or, at least, he fancied himself a competitor). Langley never succeeded in urging his Aerdodrome aloft, though Glenn Curtiss succeeded in 1914 after making significant modifications to the design. When the Smithsonian leveraged Curtiss' work to promote the Aerodrome as the first heavier-than-air, manned, powered aircraft "capable of flight", the Wright brothers were outraged and retaliated by withholding the original 1903 Flyer from the Smithsonian. Instead, it was displayed in London until the Wright-Smithsonian feud ended in 1948. Even among some of the wackier conveyances on display, I believe the Aerodrome to be the only "aircraft" in the collection that never actually flew (notwithstanding Curtiss' post hoc modifications, which were removed from the displayed Aerodrome). Though it is an interesting historical footnote, nepotism is the only reason I can see for Langley's flightless bird to be featured in the Smithsonian. When I visit an aircraft museum, I often feel as though I am on safari. What airplanes am I going to discover there? An SR-71, the world's fastest, manned, air-breathing airplane, is a rare find indeed. As emblazoned on the SR-71 tail fin, the Lockheed Skunk Works logo strikes me as needing an "ain't I a stinker?" caption. A mere twenty-four years (first flights in 1940 and 1964, respectively) separate these two technological marvels. Astounding. I can almost hear the growl! A Curtiss P-40 Kittyhawk. A Naval Aircraft Factory N3N World War II trainer on floats! Unlike its wheeled cousins, I imagine this version presented little danger of ground looping. The STOL Westland Lystander, a World War II era liason aircraft, with leading edge slats visibly deployed. One of these routinely flies at the Greatest Show on Turf in Geneseo, NY. Kelly Johnson's fork-tailed devil, the Lockheed P-38 Lightning. This particular Lightning was once flown by Major Richard bong, America's top World War II fighter ace. Bong was conducting a test flight to assess a new flight control configuration when the right engine exploded in flight. Bong survived this accident, but perished in a P-80 Shooting Star in August 1945. A beautiful Republic P-47 Thunderbolt, the heaviest single engine fighter of World War II. A Vought F4U-1D Corsair with its distinctive inverted gull wing, one of the premier fighter aircraft of World War II. A Northrup P-61 Black Widow, a purpose-built World War II night fighter. Conquest I, a Grumman Bearcat modified for Air Racing with chopped wings, smaller canopy, and a massive propeller originally belonging to a Douglas Skyraider. Darryl Greenamyer broke a 30-year-old piston aircraft speed record in 1969 when he flew Conquest I at 483 miles per hour. Impressive airplane, but I do not care for the color scheme. Another highly modified World War II fighter, Excalibur III, created from a North American P-51C Mustang. A Grumman F6F Hellcat, a Naval fighter that boasted a 19:1 victory to loss ratio in the Pacific Theater. It was simple, rugged, and reportedly easy to fly. And just look at that gap-toothed smile! Hellcat photobomb! Curtiss SB2C-5 Helldiver, a World War II era dive bomber. The Vought Kingfisher was a ship-based scout airplane. The Enola Gay, of course, was the B-29 that dropped the first nuclear bomb at the close of World War II. Display of the Enola Gay remains controversial. Regardless, there is no mistaking the historical significance of the airplane. It is presented "as is" with no value or judgement placed on its role in history. Its very presence inspires deep reflection. If I understood the docent correctly, the black, block letters "ENOLA GAY" on the fuselage are the original ones painted there prior to the mission. Focke-Wulf 190s were the only German World War II fighters with radial engines. After escaping from a German prisoner of war camp, Bob Hoover fled Germany in a stolen Fw 190. A captured Fw 190 is also attributed as Bob Hall's inspiration for the design of the Grumman Bearcat. This odd looking Dornier Pfeil was a late World War II German twin-engine interceptor featuring tractor and pusher propellers. The Messerschmitt ME-163 Komet, a rocket-propelled interceptor that was one of Germany's Wunderwaffen (wonder weapons). This was not a back-up means of generating thrust for the ME-163. The Komet's engine is quite small. A Japanese Nakajima J1N1-S Gekko "Irving". This one is the sole surviving example of its kind. This Aichi M6A1 Seiran was designed as a submarine-borne float-plane bomber. None were ever used in combat and this example is the only one to survive World War II. A Grumman Intruder viewed from an unusual angle. I still think that the MiG-21 is a cool looking airplane, even without the dramatic lighting (but it doesn't hurt). A North American F-100 Super Sabre, the world's first fighter capable of level, supersonic flight. This example is a combat veteran and was in active service from 1957 to 1978. A head on view of the Republic F-105 Thunderchief fighter-bomber, also known as the "Thud". The first Lockheed Martin X-35B STOVL (Short Take Off, Vertical Landing) aircraft ever built. The pitot mast on the X-35 has a number of additional sensors attached that appear to read pitch and yaw. This is the Pratt and Whitney turbofan capable of vectoring thrust downward to support STOVL operations for the X-35. I would hate to see the overhaul bill for this thing. It is a Lycoming XR-7755-3 thirty-six cylinder piston engine arranged in nine rows of four cylinders and rated for 5,000 horsepower at 2,600 rpm. Only two were ever built, none ever flew in anything but a test stand (turbine engines made them obsolete before development was finished), and this one is the sole survivor. Despite being hailed as the most powerful piston engine in the world, it sits in a museum as a curiosity and nothing more. Pictured here is one of the main reasons the P-51 Mustang sounds so cool, the Merlin twelve cylinder 1,490 horsepower liquid cooled engine. This particular version was built in Detroit (woot!) by Packard under license from Rolls Royce. This Hiller-conceived cross between a backpack and a helicoptor, the Rotorcycle, easily makes my "no way, no how" list. A 1943 Kellett XO-60 Autogiro. A Junkers tri-motor airliner, something of a low wing version of the Ford Tri-Motor. The first airliner with a pressurized cabin, the Boeing 307 Stratoliner, first flew in 1938 and could carry passengers up to 20,000 feet with an 8,000 foot cabin pressure. At 20,000 feet, the airliner could overfly most adverse weather. The aircraft was designed using the wings, tail, and engines of a B-17 (and was likely a far more comfortable ride for passengers than its bomber predecessor). No way, no how. The Stits SA-2A Sky Baby. This Piper PA-12 Super Cruiser, City of Washington, is companion to City of the Angels. Together, they were the first two light aircraft to fly around the world. The City of the Angels is on display at the Piper Museum in Lock Haven, PA. Seeing this airplane immediately brought a smile to my face. It is the Cessna 180, Spirit of Columbus, that Jerrie Mock flew around the world when she became the first woman to ever do so. For some reason, Jerrie never became a household name after her bold feat, but her story is worth knowing and I am pleased to see her airplane immortalized in the Smithsonian. This beautiful Stearman biplane traces its roots back to training Tuskegee Airmen in World War II. This is the first time I've ever seen a museum promote beer (or, in this case, a pale facsimile of beer). The venerable Piper Cub takes its rightful place among the aeronautical giants at the Smithsonian. It is virtually impossible to get the entire Concorde into frame, but I tried. The "Airphibian", the first government-certified roadable aircraft (flying car). You guessed it, this goes into my "no way, no how" category. It looks to me like both a lousy car and a lousy airplane. But at least it flew, quite unlike the Langley Aerodrome. When I was a kid, I read all that I could about space travel and watched the Space Shuttle go from concept to reality. Though I once saw the Challenger sitting on the launch pad in Florida, I had never seen a shuttle up close before. The Discovery is on display at the Udvar-Hazy Center, having replaced the boilerplate prototype Enterprise that stood in this spot when I visited ten years ago. As wondrous as it was to stand before the shuttle, I was a bit surprised at how crude a flying machine it appeared to be. With its slab-sided fuselage and stubby, non-cambered wings, the Shuttle is not nearly so elegant in form as most airplanes. Outgassing from tiles along the side of the nose clearly indicated the direction of the relative wind upon atmospheric re-entry. The bottom of the ship bore the brunt of frictional heating. Though perhaps not so elegant in form as its air-breathing cousins, the shuttle is nonetheless impressive in terms of what it accomplished. I spent over four hours at the Udvar-Hazy Center. I cannot claim to have seen or read all there was to see and read, but I departed extremely impressed by the amazing swath of aeronautical history on display and the number of very human stories associated with so many of these flying machines.